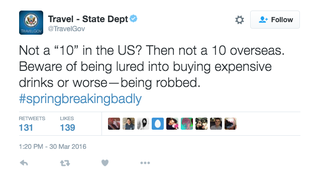 Have you guys been paying attention to the State Department’s Spring Break tips? Because you really, really should be. They are just awful. The account—which, by the away, is verified—has been dispensing bizarre advice to would-be travelers since the beginning of March. The tweets feature spelling mistakes, strange tips, and vaguely offensive assumptions about other countries. John Kerry, come get your people. “Travel goof story”! How goofy! Man, that’s not weird and vaguely racist or anything! They’re telling you not to go to Turkey, Mary Ann. Honestly, if I found a suitcase lined with cocaine, I’d be pretty happy, but that’s just me. Definitely sounds like a scam! Thanks for the tip, guys. Always a good idea to check for long-forgotten firearms before you go anywhere. “Dont carry illegal drugs ever.” Nice! No pub crawls, ever. Ever! We’ve reached out to the State Department’s social media team for comment and will update this post when we hear back.